Cook the quinoa: In a medium saucepan, bring 2 cups water to a boil. Stir in the quinoa, cover, reduce the heat, and simmer until the quinoa is tender, about 15 minutes. Prepare the dressing: While the quinoa is cooking, combine the lime juice, fish sauce, garlic, ginger, jalapeño, lemongrass, and oil in a blender and purée. 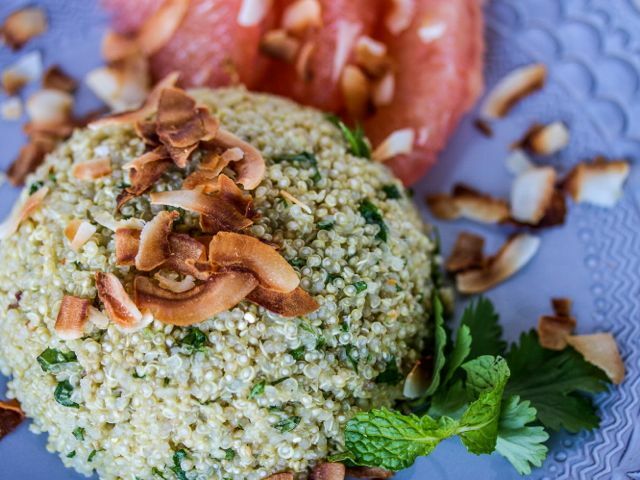 Assemble the salad: Combine the quinoa, dressing, cilantro, and mint in a serving bowl. Serve with the pomelo and garnish with the coconut.